With 2 x 3.7 MP resolution (2560 x 1440 pixels) on a 27” screen display, the 2.5K Schneider Digital passive stereo display represents a new entry in the 3D PluraView reference class. 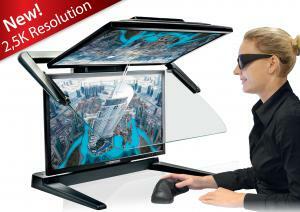 3.7 MP display resolution offers 77% more screen workspace than a full HD system with 2.1 MP. The monitor has been specially developed for the stereoscopic display of 3D software applications such as photogrammetry, scatter plot visualisation of laser scans, and for 3D data visualisation in oil and gas production. There are also many users in computer tomography, medical technology and molecular research who benefit from its 77% higher basic resolution. The new 3D PluraView 2,5K now had stereo brightness of 210 cd/m² thanks to the latest LED BackLite technology. With a virtual 17% increase in brightness compared with the full HD model, the 3D PluraView 2,5K.is even better suited to 3D stereo analysis in natural light. Maximum contrast of 12,000,000:1 and 8-bit colour depth combined with the BlackTuner technology of the new 3D PluraView 2.5K allow pixel-precise work with high-resolution 3D images. The tried and trusted innovative beam splitter mirror technology of the 3D PluraView family guarantees no flickering whatsoever, and combined with the ergonomic, passive 3D polarising glasses results in many satisfied customers. The new 3D PluraView 2.5K supports all standard 3D stereo applications under Linux and Windows. Summit Evolution from DATEM, DTMaster from Trimble (INPHO), IMAGINE Photogrammetry (LPS) from HEXAGON/erdas, Z/I ImageStation from INTERGRAPH, Gcarto/ArcGDS from Geosoft, SOCET Set/Socet GXP from BAE SYSTEMS, uSMART from SmartTech, TerraSolid, Rhino-Terrain are just some of the certified GIS solutions. With the new 2.5K base model and the successful high-resolution Thanks to 3D PluraView 4K, Schneider Digital continues to steal a march on competitors in the 3D stereo monitor market.Further information and ordering at www.3d-pluraview.com and www.schneider-digital.com.